Successfully Added 7 Inch Touchscreen Car DVD Bluetooth Media Center (1 DIN) to your Shopping Cart. 7 inch Touchscreen Car DVD Bluetooth Media Center (1 DIN). Turn your car into a hands free multi-media center on wheels and never have a boring trip again! 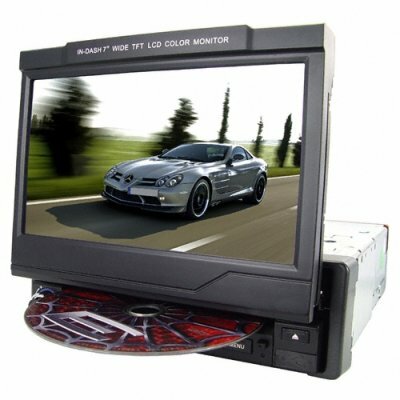 This single DIN (50mm tall) entertainment unit makes playing all your favorite CD's, DVD's, CD-R's easy and allows handsfree calling via Bluetooth for safety while on the road. Do you need to keep the kids entertained on those tedious cross-country treks? Or to take a moment to relax with your navigator at a rest stop? How about just a way to occupy that annoying backseat driver? Let this 7 Inch Touchscreen Car DVD Bluetooth Media Center (1 DIN) turn your car or SUV into a hands free movie theater on wheels, and you'll never have a dull trip again. This 7 Inch Touchscreen Car DVD Bluetooth Media Center (1 DIN) is the high-quality, low-price multimedia solution that your car has been yearning for. Pair your mobile phone with the DVD player's Bluetooth for handsfree, safer driving. The large 7-inch retractable LCD features rich colors, 480x240 resolution, and the ability to adjust the screen angle for optimal viewing angle. The remote control lets the audience in the back seat keep themselves entertained while you keep your hands on the wheel. In addition to playing full-length DVD movies, you can also plug in your USB, SD or MMC card to take your music, videos, and pictures with you on the road. This car DVD player is compatible with numerous disk and file types, including DVD, VCD, CD, MP3, MP4 and JPG, and of course has FM radio. Plus, it has rear camera input so you can connect this monitor with one of Chinavasion's rear view cameras. Once you show this 7 Inch Touchscreen Car DVD Bluetooth Media Center (1 DIN) to your friends, you'll find that suddenly everyone wants to carpool with you. Tell them to get their own from the leader in the coolest factory-direct electronics: Chinavasion.